Our Chocolatier – Chocolates by Leopold, Inc.
Leopold Schreiber began learning chocolate at age 12 under the tutelage of the corner candy store owner in his hometown. There he learned the techniques, tools and recipes needed to create quality confections. During his time with that company, Leopold was promoted to Head Candy Maker and then to General Manager of the store’s large chocolate factory. Leopold maintained his status as General Manager and Master Confectioner for 19 years. By 1997, Leopold made his personal dreams a reality by opening his own chocolate factory and store in Binghamton, NY. While there, he acquired many devoted, regular customers. 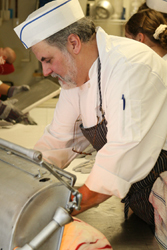 His customers had the pleasure of watching as Leopold created chocolate masterpieces such as an Aztec Pyramid, Carousels and a replica of the Binghamton Mets baseball stadium. Leopold enjoyed the opportunity to fill orders for customers no matter the size or degree of difficulty. For one customer, he created 24,000 white chocolate golf balls! In 2005, Leopold moved his factory and store from Binghamton to Montrose, PA, where he continued to pursue his passion for chocolate making. Leopold uses fourth generation German chocolate recipes to satisfy every chocolate lover’s palate. These recipes include such specialties as Buttercrunch, Cherry Cordials and Mint Delight. 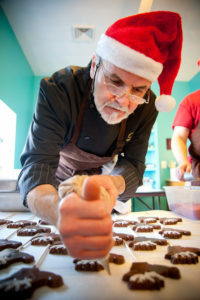 Leopold also creates mainstays such as Chocolate Bark, Truffles, and Caramels.